With so much to consider just to buy a work coat, it’s clear that there is no single best HiVis jacket for every worker. The best worksite gear for you is the gear that matches your needs, your working conditions and the climate. That being said, there are still some common features that that make certain styles ideal for construction workers, such as material that doesn’t compromise your ability to get the job done right and extra pockets for your gear. 1. Best for Working in Extreme Conditions: HiVis Extreme Softshell Jacket – This ANSI Class-3 HiVis jacket is made for the most extreme weather. This extra-warm high-visibility jacket will keep you protected, without slowing you down, down to -60°F. No, that’s not a typo. This jacket can handle the most extreme cold conditions. 2. Best Cold Weather ANSI Jacket: HiVis Insulated Softshell Jacket – You get subzero and ANSI Class 2 protection in this jacket rated to -20°F. In jobs with lots of material contact, the black lower half will hide dirt transfer better. Built to handle tough jobs without breaking down. 3. 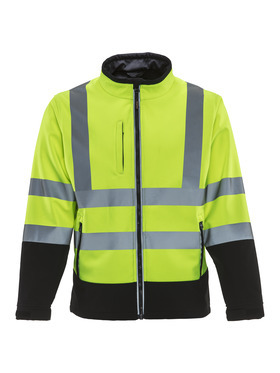 Best for Working in Freezing Temps: HiVis Softshell Jacket – ANSI Class 2 and CSA compliant, thanks to the reflective X on the back, this jacket is rated to 20°F. With stitchless bonded tape, you don’t have to worry about the daily beating your gear will take. Nobody will miss you in this HiVis coat! 4. Best for Working in High Contact Jobs: HiVis Freezer Edge Jacket – This HiVis jacket is ready to handle anything your day can throw at it. The Teflon® coated ripstop outershell is super durable and can withstand the wear and tear of the job. Rated to -30°F, it is ready to keep you warm and protected when both the conditions and the duties are tough. 5. 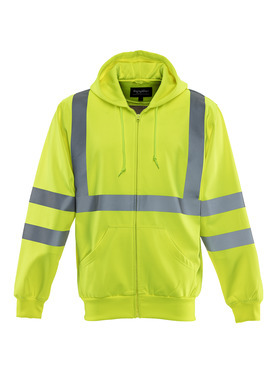 Best for Working in Milder Temps: HiVis Hooded Sweatshirt – If you’ve got a particularly hands-on job that requires constant or frequent movement, then you need this ANSI Class 2 high-visibility hoodie. It’s designed to support your range of motion so you don’t feel limited but also provides you with the core safety features required for the job. Perfect for keeping in your truck or work bag so you have an extra layer if you need it. 6. Best for Working on Rainy Days: HiVis Rainwear Jacket – Deadlines don’t change just because of rain, so having a good set of high-visibility raingear is vital. The HiVis Rainwear Jacket is entirely waterproof, keeping you guarded from rain and traffic splash. Though it’s not made for extreme cold, it’s still there to provide you with some extra warmth, thanks to the hand-warmer pockets. For head-to-toe raingear, opt for the Mid-Weight Rain Wear Set. 7. Best for Working in Demanding Environments: HiVis Iron-Tuff Jackoat® – Construction workers put themselves in some of the toughest, most demanding environments around. Your day means working with all kinds of dirty, dangerous and damaging materials and equipment, so you need PPE that’s tougher. With extra durable construction, ANSI Class-3-compliance and protection down to -50°F, this jacket works just as hard as you do. 8. Best for Working in Non-Demanding Environments: HiVis Insulated Quilted Sweatshirt – If you need quick, easy and affordable high-visibility gear, start with our HiVis Quilted Sweatshirt. It’s made for warmth, performance and all-day comfort so you can focus on the work and not the weather. Added bonus? This HiVis sweatshirt is made with pre-shrunk fabric, so you get a good fit even after many washes. This is another great option to have on hand in your truck or work bag when you need an extra layer or to pair with bibs. Construction workers endure some of the most dangerous and demanding working conditions imaginable. It only makes sense that they need to toughest, safest gear they can wear—and sometimes the warmest since they work even in the deepest, darkest depths of winter. From working at heights and risking high-level falls to making roadway repairs that require them to work next to speeding vehicles, there’s seemingly nothing construction pros won’t do to get the job done right. Since working in construction means days spent around traffic, heavy machinery and other equipment that can be unsafe in poor visibility, it’s vital that you have the right gear to keep you protected. Though most weren’t severe, there were nearly 100,000 work zone crashes in 2015 (up by 7.8 percent compared to the year prior) according to the USDOT’s Federal Highway Administration. Though 78% saw no injuries, the high number of accidents shows how important workplace safety is when working in road construction. Construction work may be risky, but it is also rewarding. Construction workers build the foundations of our communities and enjoy solid salaries, great benefits and relatively diverse day-to-day opportunities. Additionally, with the appropriate personal protective equipment (PPE), the risk of on-the-job injury or death is drastically reduced. 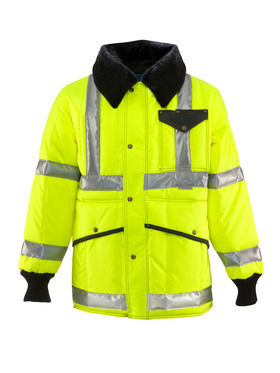 One of the key pieces of PPE for road workers is, of course, the high-visibility jacket. Let’s take a look at this fundamental piece of equipment to ensure that you’re safe and compliant. Several different government agencies have set forth (and govern) standards associated with high-visibility (HiVis) apparel to help improve the conditions of construction workers, law enforcement officers and other professionals. These agencies include the Federal Highway Administration, the Occupational Safety and Health Administration (OSHA), and the American National Standards Institute (ANSI). Each of these organizations helps determine which professionals must wear HiVis apparel, what is defined as HiVis apparel and the different types of HiVis apparel. The Federal Highway Administration requires that all workers, including emergency responders, who are exposed to traffic or work vehicles and in construction zones must wear high-visibility apparel that’s approved by ANSI under the Class 2 or 3 requirements. What Kind of High-Visibility Gear Do I Need? The very best thing you can do before selecting a piece of high-visibility gear is to check with your state’s department of transportation, which will usually be able to provide you with a list of PPE you must wear on the job. This will help ensure compliance and worksite safety. If you are required to meet specific ANSI classes, make sure you know which of the the four different classes you need. 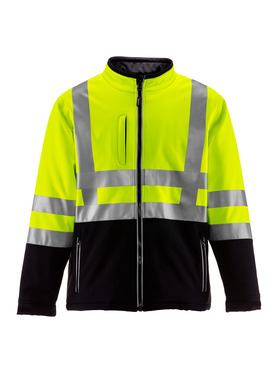 •	Class 1 high-visibility gear should be worn by those whose work requires undivided attention to traffic that doesn’t exceed 25 mph, with ample room between workers and cars. The background should not be complex. 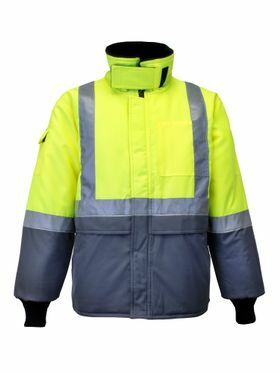 •	Class 2 high-visibility gear should be worn in inclement weather and areas with more complex backgrounds. It’s also appropriate for road workers who may have diverted attention, who work closer to traffic and who work around vehicles traveling at more than 25 mph. 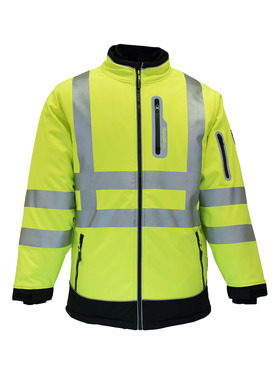 •	Class 3 high-visibility garments are best for workers who are exposed to vehicles traveling at high speeds, in areas where visibility may be compromised or when operating equipment near pedestrians. Those in this class must be conspicuous through a full range of body motions and easy to identify as a person. •	Class E high-visibility garments are those that only meet ANSI requirements when they are worn with either a class 2 or class 3 garment. As such, class E apparel consists usually of shorts, pants, or bibs. In addition to workplace regulations, make sure you’re thinking about other factors when you’re selecting the right construction work outerwear. When you work outside, you need to make sure that you’re wearing is right for the weather. 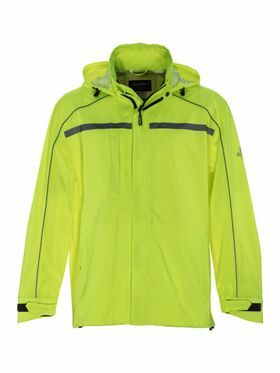 HiVis jackets come in options for all sorts of inclement weather, including cold, rain, snow and wind. You won’t be able to perform your job properly if you don’t select the safest weather-appropriate high-visibility apparel for your environment.